Produced and directed by Irwin Allen, whose long career included such TV hits as Lost In Space and Voyage To The Bottom Of The Sea, and movies like The Poseidon Adventure and The Towering Inferno. 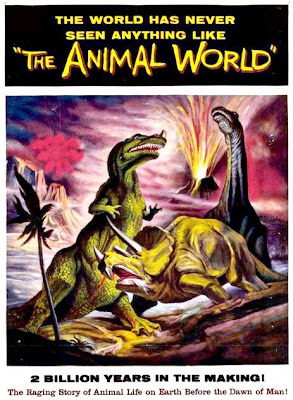 The Animal World was one of the first films to present dinosaurs in the quasi-nature documentary so beloved by the Discovery Channel today. Rarely seen now, it featured about 10 minutes of great dinosaur stop-animation by Ray Harryhausen with Willis O’Brien. The entire sequence was released as an extra on the 2003 DVD release of The Black Scorpion.